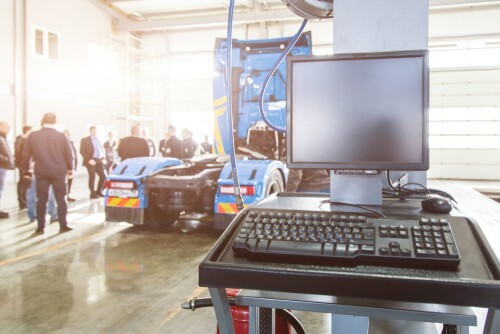 You may find issues in booking your vehicles in for Tachograph Calibration at certain centres following the issue of a faulty batch of calibration cards by the DVLA. This has lead problems with compatibility between certain types of Tacho Heads and the calibration cards. Recognising the issue, the DVSA have issued a special notice allowing a relaxation for using vehicles with the 1B motion sensor (see special notice below) on a road out of tachograph calibration until 30 April 2019 whilst they reissue a new batch of calibration cards. The 1C sensor appears to be unaffected by the issue and can still be calibrated correctly. We are currently unaware of any similar relaxation on the Continent. Therefore, international travel using these types of vehicles out of calibration may still be subject to enforcement action. Operators should contact their local calibration centre and plan accordingly. Should you have any queries, please contact a member of our regulatory team on 01254 828300. Item: 1. Page: 2. Subject: Issues with Workshop Cards. Relevant to: all. You are no doubt aware that there have been issues with the recently issued DVLA 1C/1B compatible workshop card not pairing motion sensors during 1B installations, calibrations, and periodic inspections. The 1C/1B card works as expected for 1C calibrations and pairings. After consultations with DfT, it has been decided that a new 1B only workshop card will be issued to all NTs to resolve this issue. DVLA will be issuing this new 1B card as a matter of urgency and it should be with you for the start of next week. This new 1B card will run in parallel with the 1C/1B card already issued until the end of March 2020. The new 1B only card must be treated with the same levels of security as other workshop cards. Any failures in maintaining the highest standards of security will lead to disciplinary action being taken as required. The issues with the current 1C/1B card only relate to the pairing of the 1B motion sensor with the 1B tachograph. Therefore, especially in the coming days while awaiting the delivery of the 1B only cards, technicians have confirmed that if you undertake a 1B periodic inspection using the motion sensor reader, and not the reference cable (without forcing a new pairing), then you can continue to undertake periodic inspections with no problems. However, if you use the reference cable check for your periodic inspection procedure, or have an initial 1B installation and calibration or need to pair a new 1B motion sensor, you will not be able to pair the 1B motion sensor to the 1B tachograph until the new 1B only card arrives. Any vehicles that cannot be calibrated at this moment in time will not be subject to enforcement action in respect of this requirement until 30th April 2019. Any vehicles not calibrated by 30th April will be subject to enforcement action as usual. Please pass this information on to your customers for their information. DVLA will be issuing wider industry communication updates to operators and trade associations in order to keep them informed of this situation and mitigating actions that have been put in place.